It's the last week for CASEing a card by Maile Belles over on the CASE Study Challenge blog! I went pretty literal with my interpretation...adding a more masculine look with distressing and use of these "denim" papers from Authentique's 6x6 Bundle pad. 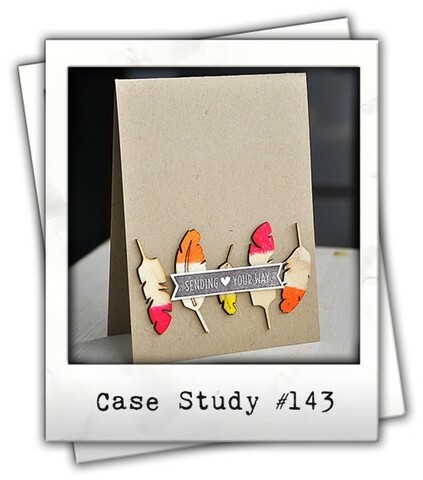 I used Tarnished Brass distress paint by Tim Holtz to make it appear that the feathers were "dipped" into the paint. 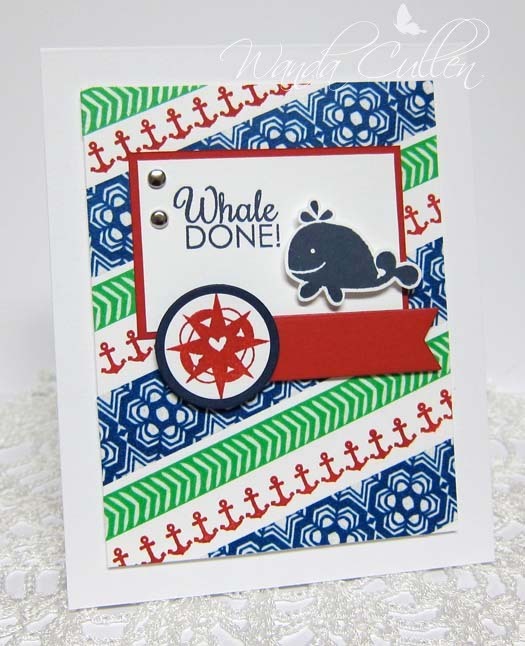 I'm also playing along with the Simon Says Stamp Challenge with an "anything goes" theme. ACCESSORIES: QuicKutz "Feathers" cutting dies, Distressing tool. Lynn has a great new color combo for us this week for the Color Throwdown Challenge! Love the way these vivid colors really pop when paired up with the neutral gray! I used lots of dies for all the elements! I first layered 3 different fishtail flags (MFT), then added rainbow and cloud dies (Lil' Inker Designs). 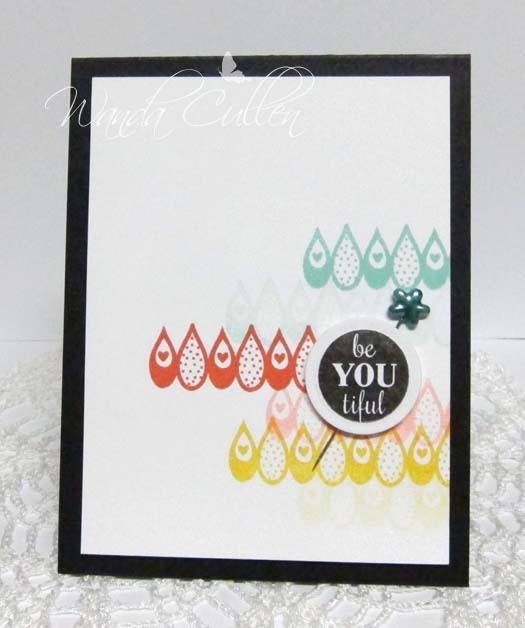 I colored the sentiment stamp (Reverse Confetti) using Tim Holtz distress markers, stamped then die cut the tag using Spellbinders' Grommet Tag die. 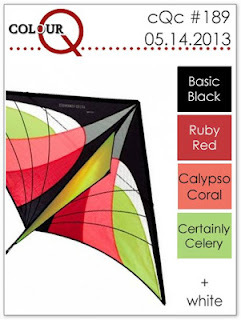 We'd love to see what you create using this fun color palette! If you don't have the exact colors, just use something close. If you upload to a public gallery, be sure and use the key words CTD244. Also, link up your card on the Color Throwdown blog using the linky tool at the bottom of the post. For more inspiration, check out the other designers' creations...including our talented May guestie, Audrey Hiltke! Thanks, Audrey, for joining us this month and sharing your talents with us! 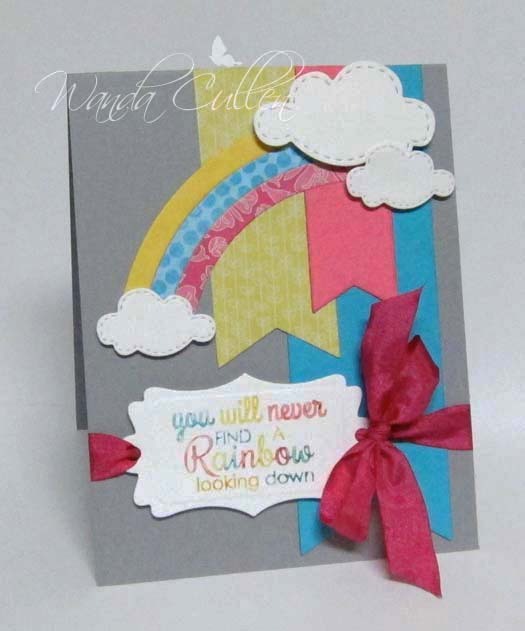 Her card from last week's challenge is what inspired me to color my sentiment this week with a rainbow of colors. PAPER: White (PTI), Real Red and Night of Navy (SU). After having to work the past three days (yes, it was hard to hear everyone talk about their FUN holiday w/e while I was slaving away - lol), I had to get inky and play with a couple of challenges this morning. 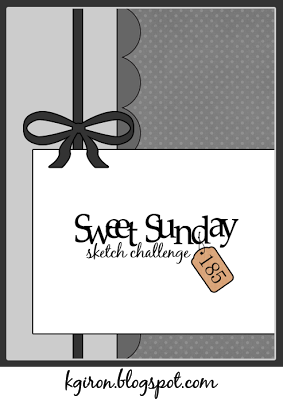 The layout is for the Sweet Sunday Sketch Challenge and I'm also playing along with Flourishes Timeless Tuesday Challenge to create a card that signifies summertime and include sheer ribbon. For me, I love the fresh fruits and veggies that are available locally in the summer! 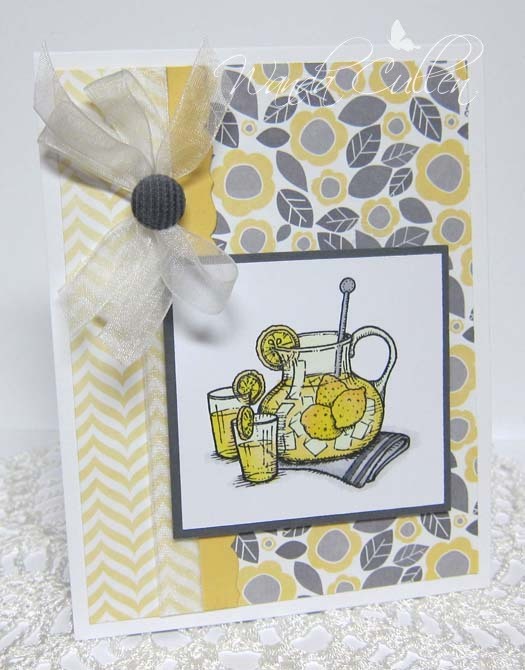 I thought this lemonade image from Flourishes' On the Porch stamp set would work perfectly for the theme. Papers are from My Minds Eye "Breeze" 6x6 pad...love the gray and yellow color combo! Have to get going and run some errands...have a blessed Tuesday everyone! Good morning again! 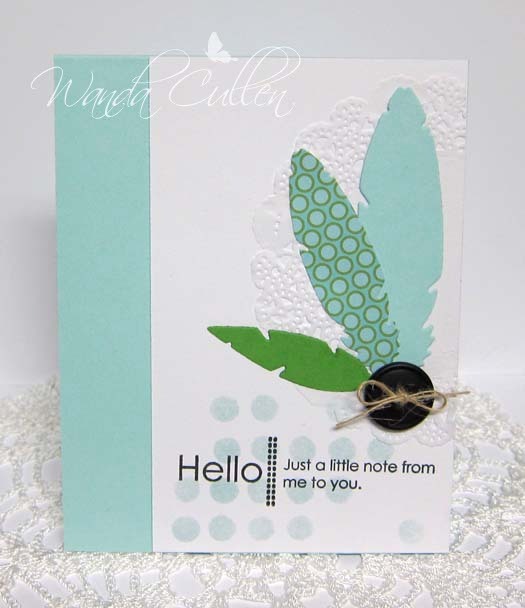 I'm back with a second post for the day with a card for two challenges on Splitcoaststampers: Technique Lover's Challenge (string it up) and CAS Challenge (get trendy with feathers). I started by sponging Soft Sky ink using a Dylusions dotted flowers stencil (obviously I only used the dotted portion) then added the sentiment. I added the doily BG and then adhered 3 different die cut feathers (QuicKutz "Feathers" die). I wanted a little pop of black, so I added jute twine to a PTI vintage button. I absolutely can't believe it's the last Monday of May already! For all my American friends, have a blessed Memorial Day - a special day of remembering those who served (and are serving now)! And...it happens to be time for another Mojo Monday challenge and this is round or square week and also contest week! I chose to make mine a 4 1/4" square card and went with flowers and girly colors after working on 3 masculine cards for Papercrafts' current submission call for a special all masculine issue. :-) I was having flower withdrawal - lol! I got some happy mail from Simon Says Stamp and this fun paper is from Carta Bella's "True Friends" pad. I also used a new (to me) hello die from Memory Box as a substitute for the flag element. The flower was stamped and fussy cut and popped with foam tape. Sadly, this is Stephanie Kraft's last day as a member of the Mojo Monday DT! We'll miss her creations, but will still keep up with her via blog land! Best wishes, Stephanie, and have a great summer! STAMPS: Let It Be (flower), Bloom & Grow (leaves) - both by Verve. PAPER: Carta Bella "True Friends", White (PTI), Hibiscus Burst (PTI). INK: Melon Mambo, Lucky Limeade. ACCESSORIES: Postage Stamp Nestabilities, Hello die by Memory Box, Heart border die by PTI, Elegant Leaves die by Verve, Brads by BasicGrey, Corner Chomper. I couldn't pass up the chance to CASE another of Maile Belles' gorgeous cards for the current CASE Study Challenge! I loved her card and knew I wanted to use PTI's 2-step peony images from the Rosy Posy stamp sets. Not sure if peonies come in yellow/orange colors...but, if they don't - they should! 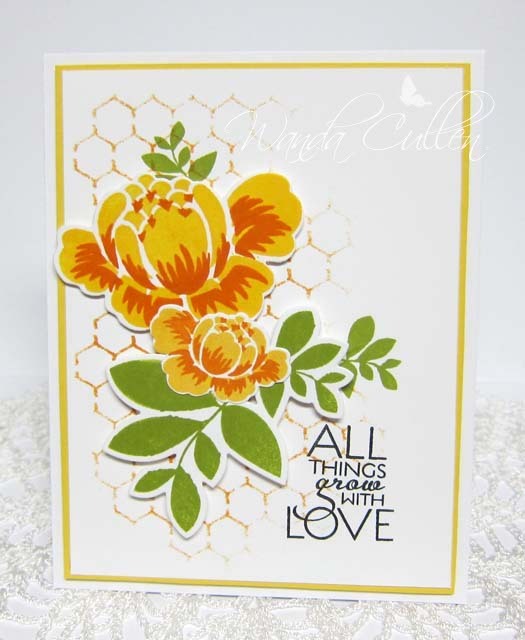 :-) I sponged More Mustard ink over a honeycomb stencil by The Crafter's Workshop (Designs by Jaime) for a subtle BG, then stamped a couple of small leaf clusters using Lucky Limeade ink. 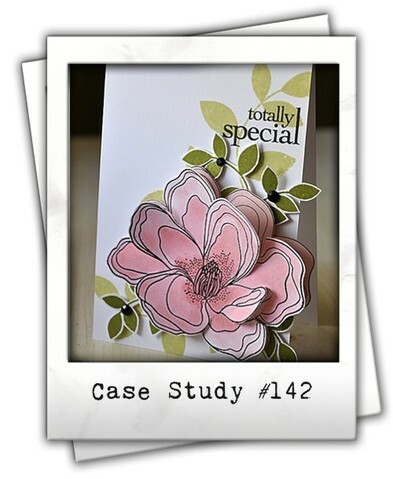 I popped some die cut leaves (Verve) and flowers (PTI) using foam tape for a quick and easy card! 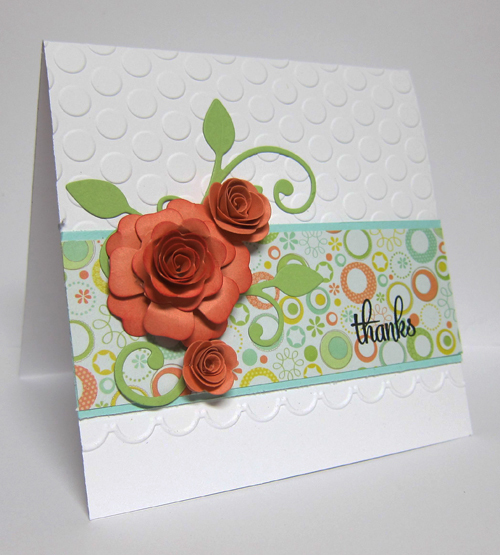 STAMPS: Rosy Posy and Rosy Posy Step 2 by PTI; Bloom and Grow by Verve (leaves and sentiment). INK: Daffodil Delight, Pumpkin Pie, More Mustard, Versafine Onyx Black. ACCESSORIES: Stencil by TCW, Elegant leaves die by Verve, Rosy Posy dies by PTI. Hi everyone! 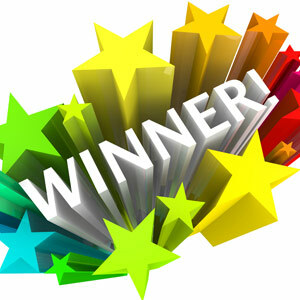 Today at noon was the deadline for commenting on my blog candy. I had 15 comments and random.org generated #6 which is Janet Mack. Congratulations, Janet! Please email me at cullenwr@yahoo.com and send me your snail mail address. I must say, you all are such a giving and kind group of ladies...but then, I always knew crafters were like that - lol! Keep on with the random acts of kindnesses...they will bless you more than the recipients! Thanks for sharing! 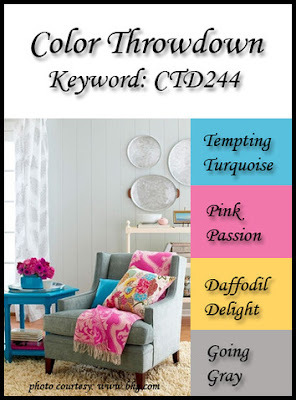 It's time for another Color Throwdown Challenge and you're going to LOVE these happy, summertime colors that Denise has picked out! My husband is a big street car fan and owns several of his own (a '34 Chevy is his current best "ride"), so this photo really caught my eye! 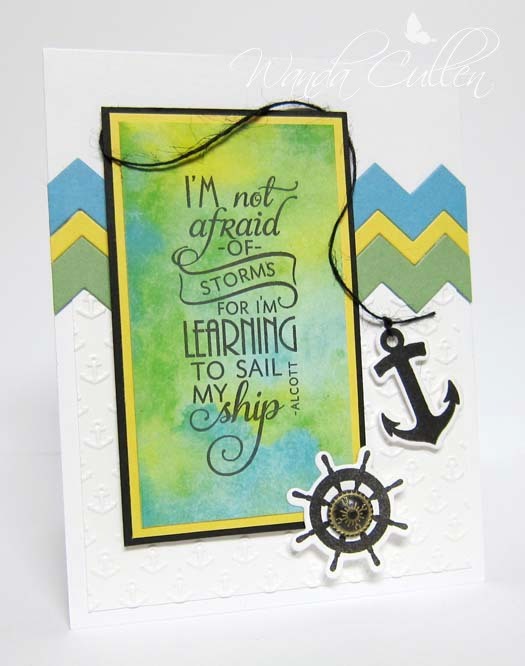 I love this Verve sentiment from the "Learning to Sail" set and was happy to see that Julee has a brand new set from her last release, "Strong Anchor", that you can mix and match with it! 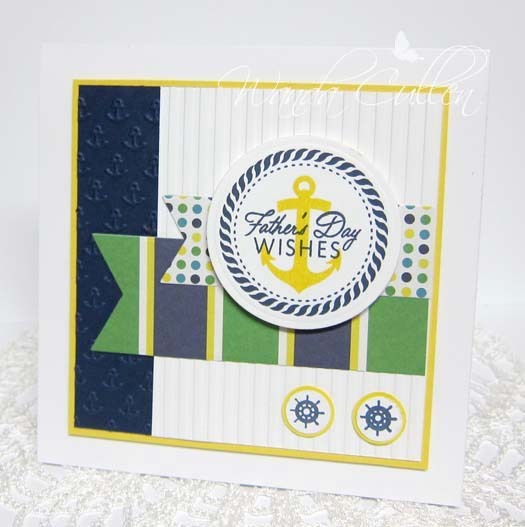 The wheel and anchor have matching dies, too! I was playing around with some new distress paints by Tim Holtz for the sentiment panel and LOVE these new paints! I placed some puddles of Mustard Seed, Broken China and Mowed Lawn paint on a scrap piece of paper, then dragged a small sheet of Neenah Solar White CS through it then spritzed it with water until it magically turned into a marble-like look. Fun but messy! The plus side is that it cleans up well with water. I used a nautical EF by QuicKutz for the lower part of the BG panel. So...get your creative juices flowing and join us. If you don't have the exact colors, just use something close. If you upload to a public gallery, be sure and use the key words CTD243. 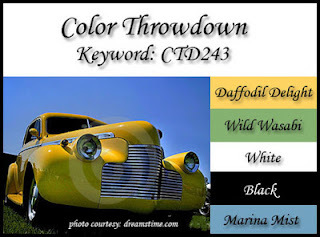 Also, link up your card on the Color Throwdown blog using the linky tool at the bottom of the post. For more inspiration, check out the other designers' creations...including our talented May guestie, Audrey Hiltke! Don't forget about my blog candy...check out THIS POST for details and leave a comment before this Friday at noon! ACCESSORIES: Classic Frames template die by Flourishes, Butterfly punch by Martha Stewart, Tiny Tags punch by SU, Red jute twine, Sentiment Flag die by Lil' Inker Designs, Copics. Thanks for stopping by...the washer is on its way. Good Mojo Monday to you! Hope you're ready to play along with another fabulous sketch designed by Julee! I went with some bold papers from the Kate and Co. line from My Mind's Eye called "Oxford Lane" - perfect for Verve's new nautical set, "Strong Anchor". I tied a sailor's knot with Blue Hawk Twisted Mason Line found at Lowes (Walmart was out of the cotton worsted thread that I normally use). You can find the tutorial by Bar Anders in the Tips/Tutorial tab at the top of my blog. I layered the cording over a strip of navy blue satin ribbon. 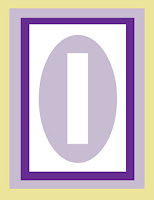 The rest of the card is pretty simple and straight forward. PAPER: Oxford Lane 6x6 pad by MME, White by PTI. INK: Night of Navy, Daffodil Delight. ACCESSORIES: Circle punches, Circle Nesties, Cording, Satin ribbon. 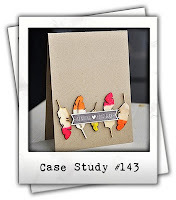 Laura has a fun challenge hop over on the Lil' Inker Designs blog...check it out HERE! We were to be inspired by this photo...a fabulous summertime collage with sunshiney colors and clouds...just perfect to get out my fave cloud dies (love those stitched details!). Because of the faux stitching, I'm also entering this into the TLC gallery of SCS to use crazy stitching on a card. I had a little creative spurt and decided to try a scallop design by cutting the die shape from the Flags and Tags Stamp set in half. Thought it turned out to be a fun and funky border! 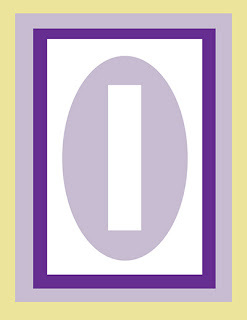 :-) My all-time, most used Lil' Inker Designs die is the sentiment flag! Had to tuck in a small sentiment of thanks using it. 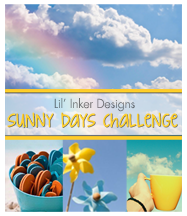 After some cooler, rainy weather over the weekend, I was ready for a sunny days challenge! So, I'm lifting my glass of lemonade with a toast for more sunny days! Cheers! PAPER: Family Ties by Pebbles, White by PTI, Green (?) scrap from my scrap pile. INK: Old Olive (to sponge leaves), Daffodil Delight, Versafine Onyx Black. The CAS challenge on SCS has a theme this week: What smells great to you? 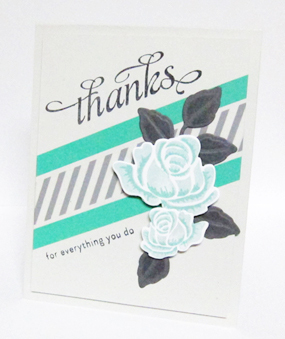 I love to smell roses, so this quick card using washi tape and double stamped PTI roses fit the bill! I sponged the leaves with Basic Gray ink on Basic Gray CS while they were still in the die. The flowers were stamped using Soft Sky for the base and Pool Party for the highlighted areas. 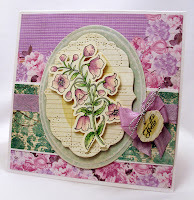 The card base is a lovely new neutral I discovered from PTI called Soft Stone. ACCESSORIES: Foliage die by SB, Rosy Posy dies by PTI, Crafting tape by Recollections. There's something new going on this summer over on the Flourishes blog...a designer focus every Friday! We get to know the design team better, then we get a chance to win some new goodies by CASEing one of their cards! Julie Koerber is being featured this week and she has got a fabulous gallery! I chose this card on the right to CASE...so beautiful! I used the same layout but changed up the image, the colors and omitted some of the layers. 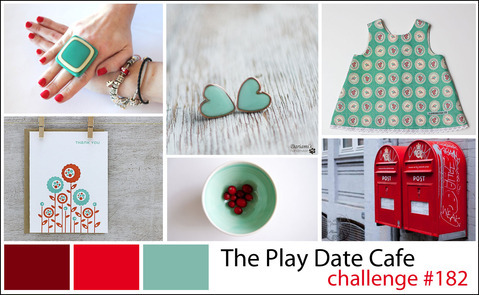 I'm also playing along with the Play Date Cafe Challenge - to use Maroon, poppy and soft jade colors. I colored this lenten rose image with Copics, then fussy cut and adhered with foam tape. STAMPS: Lenten Rose (Flourishes), Hydrangea (Flourishes) - sentiment. PAPER: This & That pad by Echo Park, White (PTI), X-Press It Blending Card. 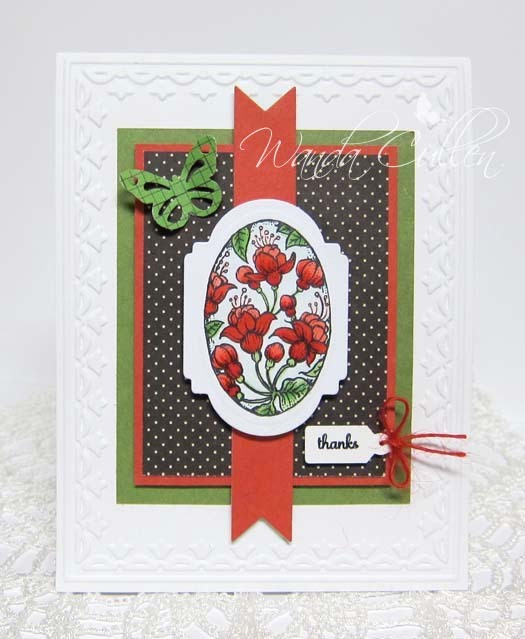 ACCESSORIES: Victorian Oval template die by Flourishes, Seam binding by Verve. I'm long overdue with some blog candy, so I decided since May is my favorite month of the year, I'd like to give some goodies away just because! Just because I consider all my blog readers to be special! No big requirements needed. Just leave me a comment in this post and tell me about a time when you did a little (or big) random act of kindness! That's all! So...what am I giving away? Ever do a dumb thing like overlook an online shopping cart number that says you want 2 instead of ONE item? Yep. That was me with a recent Papertrey Ink order. I got 2 larger than life poppy prints, so that means one of you lucky readers will benefit from my mistake! 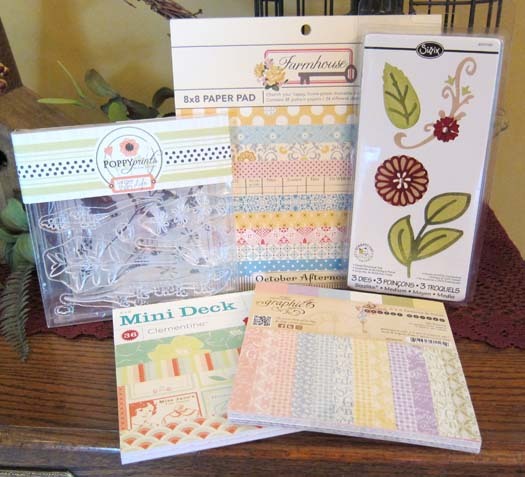 I'm also giving away THREE paper pads and a Sizzix Floral Botanical set of dies. I'll do a random draw next Friday, May 24, so spread the word! Good luck! 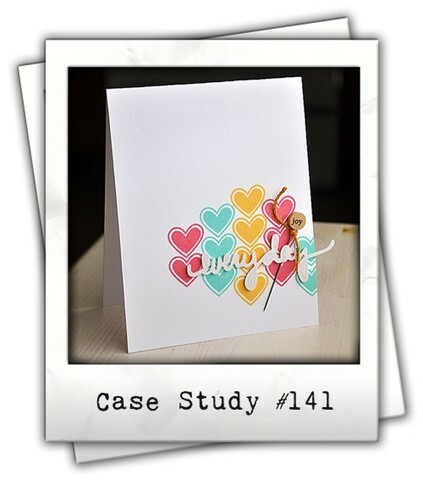 I just had to create a quick CAS card for one of my fave challenges...CASE Study. Maile Belles creates CAS like no other, so loved practicing the less is more concept. Here it is again...images from Reverse Confetti's Peacock Pretties set! Ink colors are Pool Party, Calypso Coral and Daffodil Delight - stamped off for the second line of color. A little stick pin by Little Yellow Bicycle was added behind the popped up sentiment circle. You know the saying...April showers bring May flowers...so that's what the Ways to Use It challenge on SCS is all about - using flowers! You know I won't pass up that opportunity! 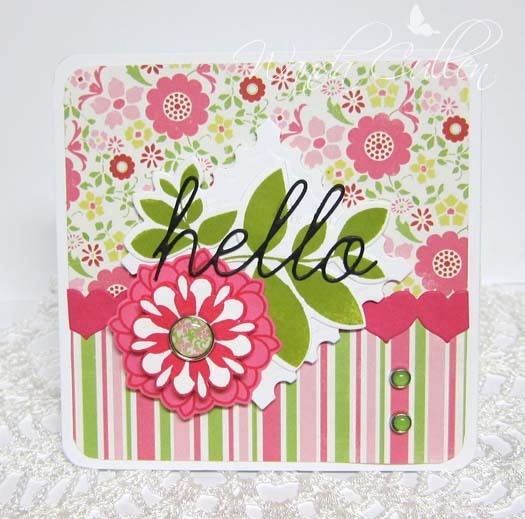 This is a really simple card with embossing (there's that sweet little SU scallop border I love so much! 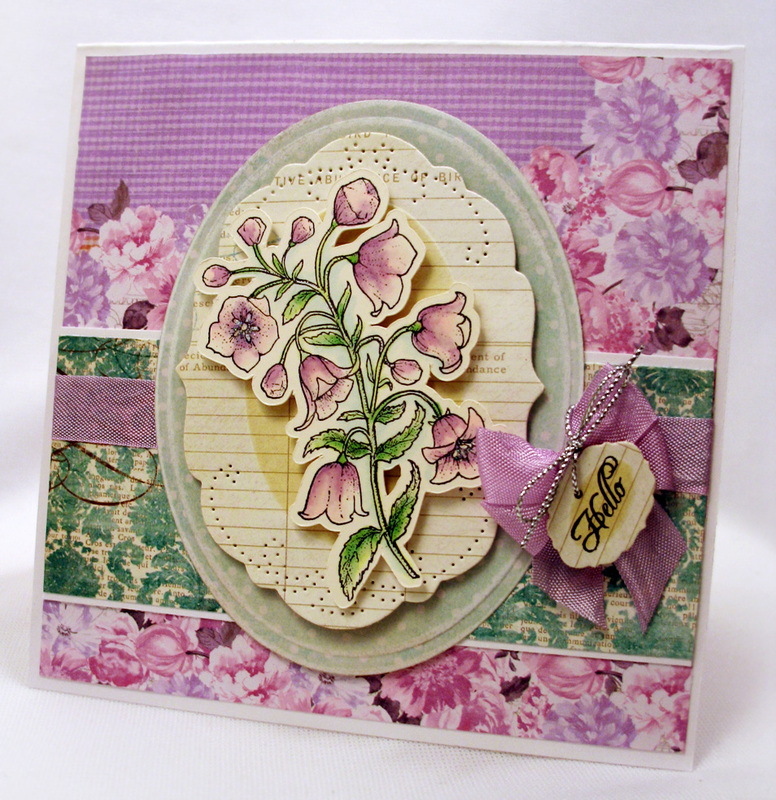 ), a border of DP from We R Memory Keeper's Simply Spring collection, and a leafy flourish topped with rolled roses. I'm also entering this into the Simon Says Stamp Challenge which has the theme of flower power. 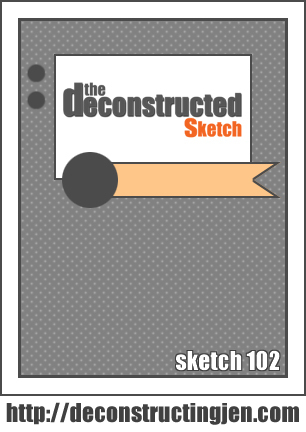 My second card is for Jen Shults' Deconstructed Sketch Challenge...just perfect for inking up some new Verve! 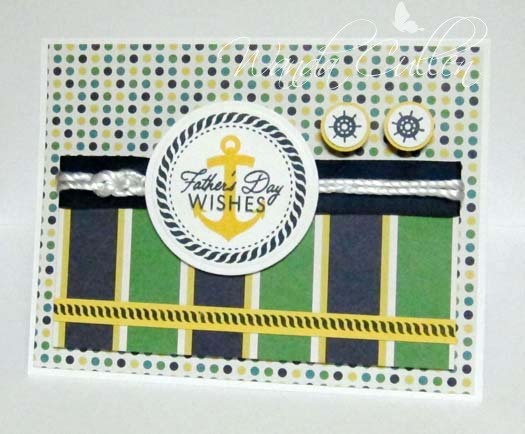 I've had this pair of QuicKutz embossing folders for some time and they worked well with the nautical theme. Love the bold, masculine papers in MME's "Oxford Lane" pad from their kate & co. collection! I'm so glad Julee included these teeny wheel images - perfect for a little "button" accent! STAMPS: Strong Anchor by Verve.